EM-M24 conditioning amplifier provides complete galvanic isolation between input, output and supply. Frequency ranges are DIP-switch settable. Input and output ranges can be selected individually. Input filtering can be selected from two alternatives. The effect of zero and gain adjustments is ± 15 % of the selected range. Zero and gain adjustments have no mutual effect. 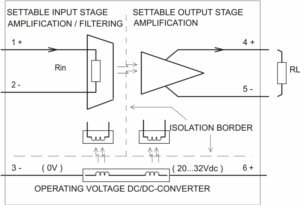 The output of the amplifier is short-circuit protected and the operating voltage input is protected against incorrect polarity. Current requirement 60 mA max.